Is Abandoned Pathology Lab Connected to Recent Roswell Alien Body Claim? This story has been brewing for several weeks...but as a result of the recent 'Roswell alien body' hoax, could there be a connection? Tobolsk police and other authorities may have unraveled the mystery of the mummified remains of babies found in a lab reported by citizens. In the neglected Western Siberia facility, there have been human organs and bones left scattered about, and officers have probed into its hideous discovery. On the bodies of the babies, they were visible scars. According to Siberian Times, the scars show that surgical procedures were carried. 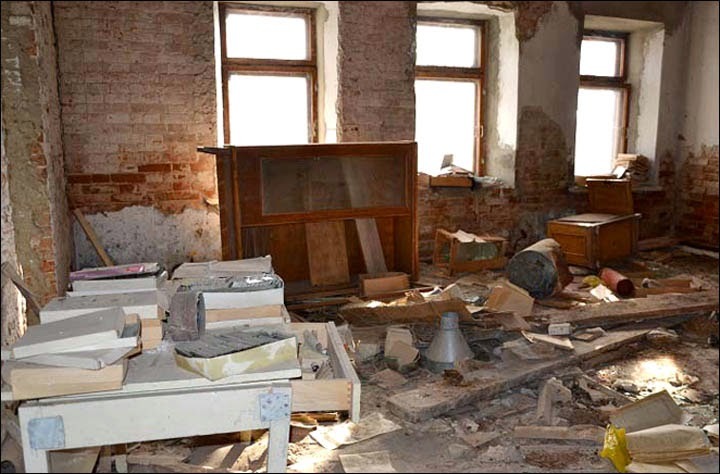 There were 'withered corpses' of babies, according to local news website Tobolsk.info. On one example, the head is like a tiny-onion-shaped, slanting huge catlike eyes occupying a huge part on its face. Is it possible that this lab was attempting to create some type of hybrid being? Slides used for blood tests, files and surgical books were also among the debris of the rundown building, while one plastic bottle on a shelf was dated January 2012. As the student Georgy Grigorchuk wandered around the building he also found an empty morgue and documents outlining the medical histories and post-mortem procedures of all the patients, including family names and personal details. It is known that the premises were abandoned when the pathology facility was moved to a new building at the region's hospital, but it is of concern that so much was left behind. 'I learned about this place from other students of my medical college', he said. 'I heard that in this laboratory were a lot of abandoned things - books lying around, organs in glass jars, all sorts of documents. It was very interesting for a medical student'. Since the student's discovery, the door to the lab has been vandalised but nothing has been taken away. Graffiti also covers part of the front of the building. But later the door was nailed shut, even though the macabre contents of the old laboratory were not removed. It is not known if they have contacted the parents of dead children identified in the medical records. it was basically ignored and forgotten for decades until Stanton Friedman initiated it's rather sudden re-discovery and subsequent over-popularization. How did it suddenly become the quintessential E.T. case? of more importance to me but its potential connection to the Roswell debacle is really rather irrelevant. be it by the PTB or renegade groups looking for money,power and/or vengeance should be a much greater concern to us. man is arguably the greatest threat to his own survival. survival at any price is likely to come at too high of a price if the details of that survival are dictated by those who have engineered the power and profit$ that have come from the tyranny of war and poverty. What would then ensue is perpetuation of existence and not the triumph of Life. yet no war is civil. there would be no war. It would be much better if they would be MUCH better if they would just eradicate each other in hand-to-hand combat and leave the rest of us alone! Debt slavery is the oldest and still the most popular form of slavery. It is a horrid thing. elements such as phosphorous and oil are being recklessly processed and depleted while geopolitical and financial pressures&stress are escalating. Plagues that also result in sterility would be especially effective. That is why strange lab discoveries like this are so important. Why was the lab not even covered or "cleaned" up? David Kelly's murder surely was not.